The Betty and Barney Hill story is one of the prototypical alien abduction cases. It contained elements which have been encountered many times since, as reports of abduction by extra-terrestrials have become a more and more important part of the modern UFO phenomenon. It all started on September 19th 1961. Betty and Barney Hill, a husband and wife, were driving home from a brief holiday in Canada. As they travelled along the road, they noticed a strange light in the sky. At first they thought it was a star, but it appeared to be moving along with them. They each peered through binoculars at the object in the sky and Barney saw what he thought was some kind of craft whose odd-looking occupants were peering down at him. The couple grew alarmed and tried to get away from the lights, which now seemed to be swooping down towards them. When the couple reached their home, they were puzzled by strange scuff marks which appeared on the car and on some of their belongings. Later, they realised that the journey had taken far longer than it should have and that they could not account for around two hours of their travel time. Police Involvement In The "Alien Abduction"
Betty and Barney Hill reported their experience to the police who were as mystified by it as they were. They then tried to put the incident behind them and resume a normal life. But they found themselves haunted by anxiety in their waking hours and nightmares in their sleep. After some time, they consulted a psychiatrist. The psychiatrist hypnotised them in an attempt to recover the lost memories of whatever was troubling them. A series of frightening revelations flooded out. It seemed that the car had stopped on the road and was surrounded by strange beings. They were humanoid in appearance with “wrap-around eyes,” prominent craniums and a dark grey skin. The couple led taken onto an alien craft, a UFO, moved into separate chambers, stripped of their clothing and subjected to some kind of experiments. Betty recalled crying out in pain as a needle was inserted into her navel. One of the aliens seemed to be surprised by her cry of pain. He made a gesture in response to it, and the pain immediately disappeared. The extra terrestrials communicated telepathically with the Hill couple although they spoke an audible but incomprehensible language to each other. Betty asked if she could take something as a memento of the experience and was given a book with strange symbols on it. Later, however, another alien overruled this decision and ordered the book taken back, declaring that the Hills would not be allowed to retain a memory of the incident. At one point, Betty asked the aliens where they came from and was shown an image of a star map. Lacking any special knowledge of astronomy, it didn’t mean much to her. But amateur astronomer Marjorie Fish later consulted with Betty Hill and asked her to recreate the map as best she could. Betty drew the map that she remembered seeing under post-hypnotic suggestion and, after carefully examining it, Marjorie Fish came to the conclusion that it represented the stars of the Zeta Reticuli system, about 39 million light years from Earth. Professional astronomers have examined Fish’s work on the star map and been impressed by it. One statistician declared that the chances of finding an actual set of stars which corresponded so closely to a series of randomly drawn dots would be around 1 in 1000. One of the most striking features of the Betty and Barney story is that each recalled the same experience separately, in hypnosis sessions of their own, unaware of what the other was saying. The details matched. There are sceptics of the Hills’ story but few allege that the couple were frauds. The psychiatrist who treated them refused to believe that they were abducted by aliens but was nonetheless convinced of their sincerity. He speculated that perhaps a genuine UFO encounter had been followed by nightmares about it, and that dream may have become confused with reality. The Betty and Barney Hill case remains one of the most intriguing in the annals of ufology. Its characteristic features – Grey aliens, some form of scientific test or procedure being carried out, no conscious memory of the incident in the alien abduction, and the phenomenon of “missing time” – have since been encountered in many other cases with extra-terrestrials. 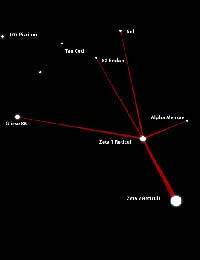 The Star Map, pointing to Zeta Reticuli, remains one of the most fascinating aspects of the story. Scientists agree that Zeta Reticuli is one of the nearby star systems most likely to harbour life. Why Don't Aliens Make Open Contact?